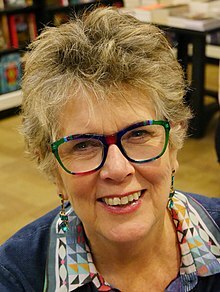 Prudence Margaret "Prue" Leith, CBE, DL (born 18 February 1940) is a British-South African restaurateur, chef, caterer, television presenter/broadcaster, businesswoman, journalist, cookery writer and novelist. She is Chancellor of Queen Margaret University, Edinburgh. She was a judge on BBC Two's Great British Menu for eleven years, before joining The Great British Bake Off in March 2017, replacing Mary Berry, when the series moved to Channel 4. Leith was born in Cape Town, South Africa. Her father, Sam Leith, worked for African Explosives, a subsidiary of ICI producing dynamite for use in mines and ultimately served as a director. Her mother, Margaret 'Peggy' Inglis, was South Africa's best-known actress of her time. From the age of 5 until she was 17, Leith attended St Mary's School, Waverley, an English independent private boarding school for girls in Johannesburg run by Anglican nuns. She left with a first class matriculation and studied at Cape Town University where she failed to follow for any length of time courses in drama, fine art, architecture or French. She persuaded her parents to allow her to attend the Sorbonne (formally, the University of Paris), ostensibly to better learn French while studying the Cours de Civilisation Française. While in Paris, she finally realised she wanted a career in the premium food industry. In 1960, Leith moved to London to attend the Cordon Bleu Cookery School and then began a business supplying high quality business lunches. This grew to become Leith's Good Food, a party and event caterer. In 1969, she opened Leith's, her Michelin starred restaurant in Notting Hill, eventually selling it in 1995. In 1975, she founded Leith's School of Food and Wine which trains professional chefs and amateur cooks. The group reached a turnover of £15m in 1993, which she then sold. In 1995, she helped found the Prue Leith College (since renamed Prue Leith Chef's Academy) in South Africa. Concurrently with running her business, Leith became a food columnist for, successively the Daily Mail, Sunday Express, The Guardian and the Daily Mirror. Aside from writing 12 cookery books, including Leith's Cookery Bible (with the Leith's School of Food and Wine Principal, Caroline Waldegrave), she has written seven novels: Leaving Patrick, Sisters, A Lovesome Thing, Choral Society, A Serving of Scandal, The Food of Love: Laura's Story and The Prodigal Daughter. These last two form part of the Food of Love trilogy. The trilogy has been optioned for a TV series by Sprout Pictures in partnership with Parallel Films. Her memoir, Relish, was published in 2012. Her first television appearance was in the 1970s as a presenter of two thirteen-episode magazine series aimed at women at home, made by Tyne Tees Television. She was a last-minute replacement for Jack de Manio, and with no experience and a director who liked everything scripted, including interviews, she disliked the experience. Later, in the 1980s, she was the subject of two television programmes about her life and career: the first episode of Channel Four's Take Six Cooks and the BBC’s The Best of British, a series about young entrepreneurs. In 1999, she was one of the Commissioners on Channel 4’s Poverty Commission. She came back to television to be a judge on The Great British Menu (BBC Two) for eleven years until 2016, and a judge for My Kitchen Rules (Channel 4), which she left to replace Mary Berry in The Great British Bake Off on Channel Four. She has been involved in food in education. When chair of the Royal Society of Arts she founded and chaired the charity Focus on Food (now part of the Soil Association) which promotes cooking in the curriculum. She also started, with the charity Training for Life, the Hoxton Apprentice – a not-for-profit restaurant which for ten years trained the most disadvantaged long-term unemployed young people. Until 2015, she was a member of the Food Strand of the grant giving foundation, Esmée Fairbairne. From 2007–10, she was the Chair of the School Food Trust, the government quango largely responsible for the improvement in school food after Jamie Oliver’s television exposé of the poor state of school food. The Trust (now the Children’s Food Trust) also set up and runs Let’s Get Cooking, an organisation of over 5000 cooking-clubs in state schools, of which she is a patron. She is Vice-President of The Sustainable Restaurant Association, a trustee of Baby Taste Journey (an education charity concerned with healthy food for infants); Patron of The Institute for Food, Brain and Behaviour, Sustain’s Hospital Food Campaign, and the Prue Leith Chef’s Academy in her native South Africa. She has also active in general education, chairing Ashridge Management College (2002–07); 3E’s Enterprises (an education company successfully turning round failing schools and managing academies (1998–2006) and Chairman of Governors at the secondary school, Kings College in Guildford (2000–7). She has also been involved in many diverse organisations: she chaired the Restaurateurs Association (1990–94); she was a member of the Investors in People working group; she chaired the RSA (Royal Society of Arts) (1995–97); and Forum for the Future (2000–3). She was a director of the housing association, Places for People (1999–2003) and a member of the Consumer Debt Working Group that contributed to the Conservative Party's 2006 policy document "Breakdown Britain” (2004–5). While at the RSA she led the successful campaign to use the empty plinth (now known as the Fourth Plinth) in Trafalgar Square to house changing sculptures or installations by the best contemporary artists. Leith has been a non-executive director of British Rail; British Transport Hotels; Safeway; Argyll plc, the Leeds Permanent Building Society; Whitbread plc; Woolworths plc; the Halifax; Triven VCT; Omega International plc; and Belmond Hotels Ltd (formerly Orient Express Hotels) and is a director and investor in several start-up companies. In July 2017, she was installed as the Chancellor of Queen Margaret University, Edinburgh. Leith was married from 1974 to author Rayne Kruger, who died in December 2002, aged 80. The couple had two children, a son and a daughter. Their daughter, Li-Da Kruger (a Cambodian adoptee), is a filmmaker. Their son, Danny Kruger, left his job as a speechwriter and advisor to David Cameron to establish jointly with his wife Emma the Only Connect charity, which works with prisoners and ex-offenders. In October 2016, Leith married John Playfair, a retired clothes designer. Her brother, ex-restaurateur James Leith, is married to the biographer Penny Junor. Leith's honours include the Veuve Cliquot Business Woman of the Year in 1990, and thirteen honorary degrees or fellowships from UK universities. She was appointed Officer of the Order of the British Empire (OBE) in 1989 and Commander of the Order of the British Empire (CBE) in the 2010 Birthday Honours. ^ a b "SA POWER 100 — 2012: Prue Leith". The South African. 2 October 2012. Retrieved 29 December 2018. ^ "Debrett's - The trusted source on British social skills, etiquette and style". Debrett's. ^ "The Great British Bake Off unveils new line-up". BBC News. 16 March 2017. Retrieved 16 March 2017. ^ "Celebrity chef becomes Queen Margaret University chancellor". BBC. 6 October 2016. Retrieved 30 November 2018. ^ "Caroline Waldegrave and Prue Leith: How we met". The Independent. 10 October 2015. Retrieved 30 November 2018. ^ Leith, Prue (4 March 2017). "Prue Leith: My Bake Off 'fake news' moment". The Spectator. Retrieved 29 April 2017. ^ "Aide who wrote Cameron's hug-a-hoodie speech is attacked... by a Hoodie". Evening Standard. 3 July 2008. Retrieved 29 April 2017. ^ Furness, Hannah (25 November 2016). "Prue Leith: the secret to a happy marriage is separate houses". The Daily Telegraph. Retrieved 29 April 2017. ^ "Media families; 8. The Junors". The Independent. 6 April 1997. Retrieved 29 April 2017. ^ "News article about honorary degree from City University". Archived from the original on 30 June 2006. ^ "Article about Leith's honorary degree from the University of Warwick". Archived from the original on 8 October 2013. ^ "No. 59446". The London Gazette (Supplement). 12 June 2010. p. 7.